Successfully Added Xiaomi Mi Mix 2 Android Phone - 128GB Memory, Snapdragon CPU, 6GB RAM, ANdroid 7.1, 5.99 Inch Screen, 4G, Dual SIM, NFC to your Shopping Cart. The flagship phone from Xiaomi and the handset that showcased their latest talent is, of course, the Xiaomi Mi Mix 2. This 2nd generation of bezel-less phone is simply breathtaking. Its design is mind-blowing with a 5.99-inch edge to edge display that delivers spectacular color range, brightness, and a crisp quality that's nothing short of excellent. The Mi Mix 2 will take your phone experience to a whole new level with its immersive user experience for media and games. It's not just stunning visuals that make the Mi Mix 2 a spectacular smartphone. This handset has a fearsome performance as it is powered by the Qualcomm Snapdragon 835 Octa Core CPU and a whopping 6 GB of RAM. This puts its performance on a par with the Samsung S8 and latest Apple phone devices. On this version of the Mi Mix 2 cell phone you can enjoy 128GB of internal storage which should be plenty, even for the most demanding users. A sizable 3400mAh offers great usages times and it is remarkable how the engineers at Xiaomi fitted all this goodness into such an elegant slim package. When it comes to connectivity the Mi Mix 2 smartphone has perhaps the most comprehensive network support of any Chinese made phone. The dual nano SIM dual IMEI setup lets you connect to a full scope of over 19 4G bandwidths and has a comprehensive 3G and 2G network coverage, This ensures you should have a strong and stable connection wherever you are. If you're close to a wireless network then you can enjoy super fast dual band wifi with the 802.11 a/b/g/n/ac 2.4G and 5G support that makes downloading media and playing online games quickly and lag free. A 12 MP rear camera is there for all your photography needs and can even shoot video in 4K resolutions. With this smartphone by your side, you can dispense with the need for a dedicated camera and enjoy some stunning pghotograpgy and selfies to be proud of. 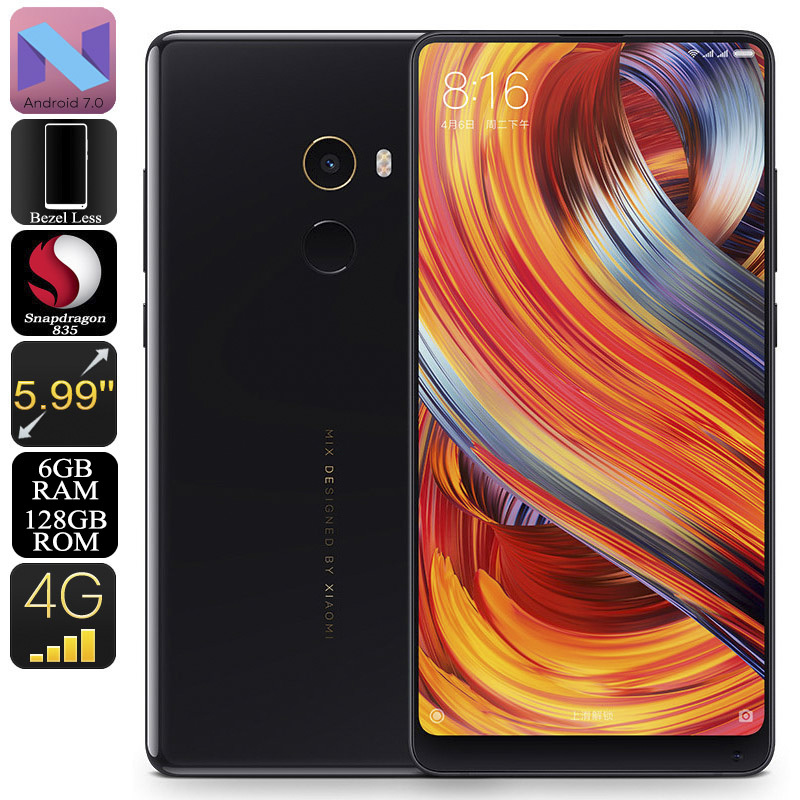 The Xiaomi Mi Mix 2 smartphone comes with a 12 months warranty, brought to you by the leader in electronic devices as well as wholesale Android phones.